What Is Money? Chapter 3. 2 Meaning of Money Money (=money supply) any vehicle used as a means of exchange to pay for goods, services or debts. Money. 2 2 Meaning of Money Money (=money supply) any vehicle used as a means of exchange to pay for goods, services or debts. 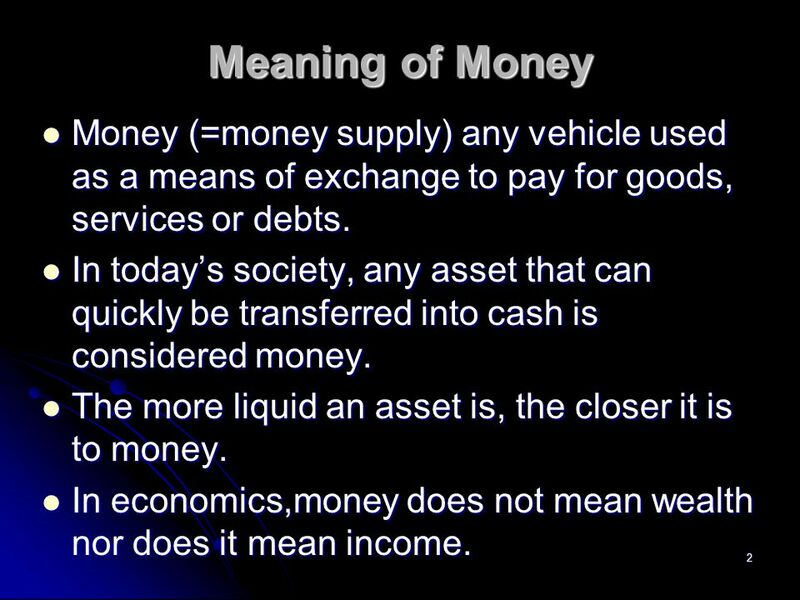 Money (=money supply) any vehicle used as a means of exchange to pay for goods, services or debts. In today’s society, any asset that can quickly be transferred into cash is considered money. In today’s society, any asset that can quickly be transferred into cash is considered money. The more liquid an asset is, the closer it is to money. The more liquid an asset is, the closer it is to money. In economics,money does not mean wealth nor does it mean income. In economics,money does not mean wealth nor does it mean income. 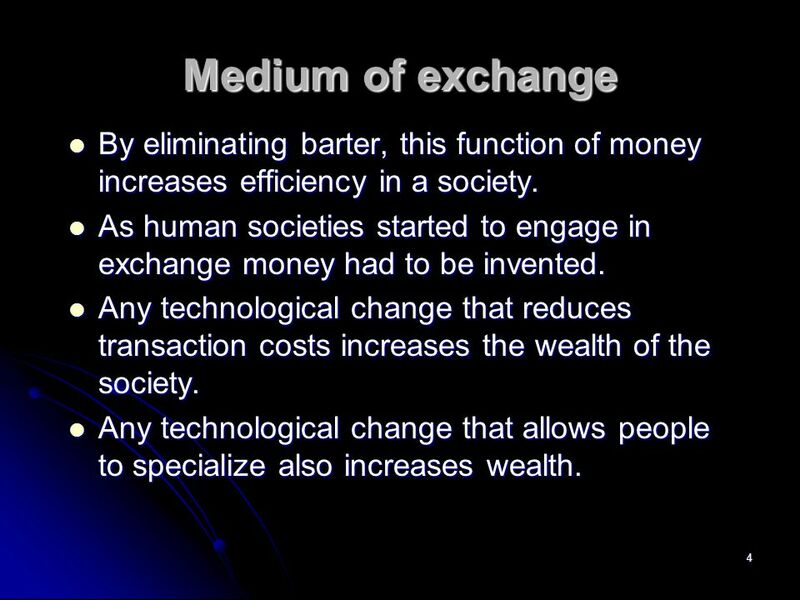 4 4 Medium of exchange By eliminating barter, this function of money increases efficiency in a society. By eliminating barter, this function of money increases efficiency in a society. As human societies started to engage in exchange money had to be invented. As human societies started to engage in exchange money had to be invented. Any technological change that reduces transaction costs increases the wealth of the society. Any technological change that reduces transaction costs increases the wealth of the society. Any technological change that allows people to specialize also increases wealth. Any technological change that allows people to specialize also increases wealth. 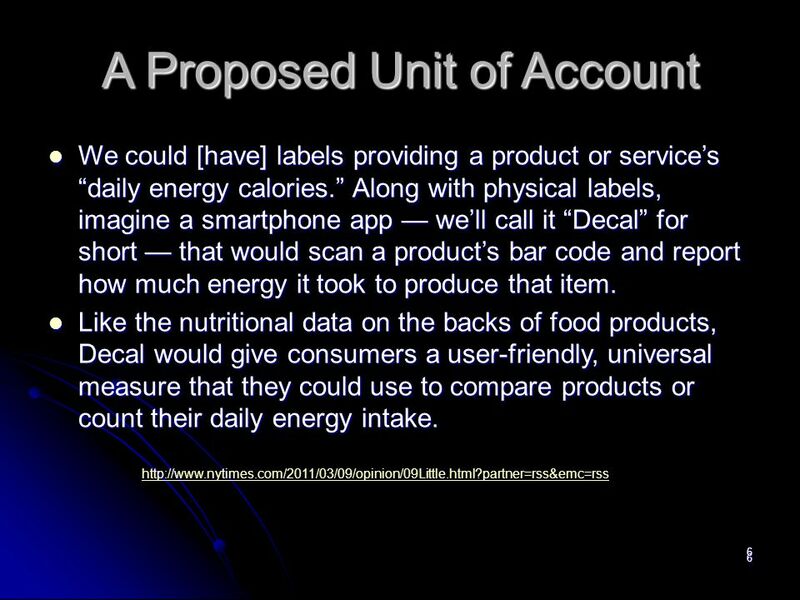 5 5 Unit of Account We use money to measure the value of goods and services. 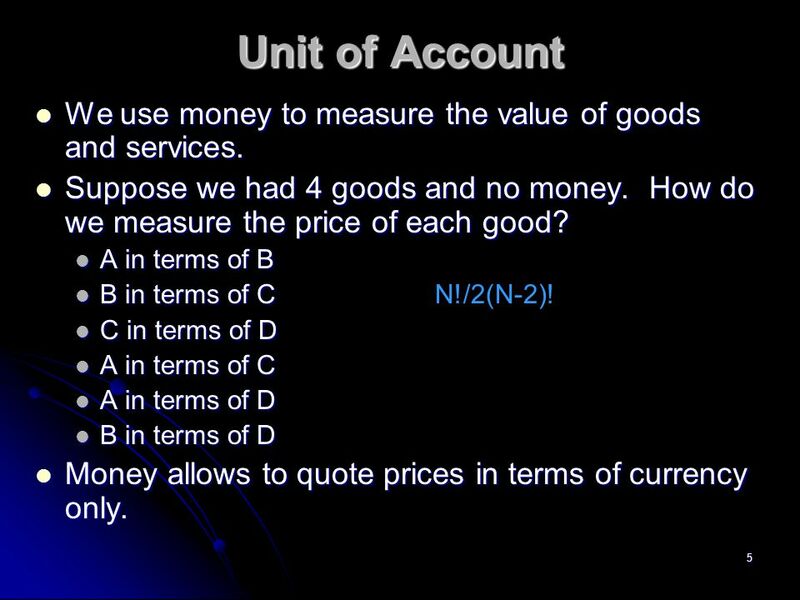 We use money to measure the value of goods and services. Suppose we had 4 goods and no money. How do we measure the price of each good? Suppose we had 4 goods and no money. How do we measure the price of each good? A in terms of B A in terms of B B in terms of C B in terms of CN!/2(N-2)! C in terms of D C in terms of D A in terms of C A in terms of C A in terms of D A in terms of D B in terms of D B in terms of D Money allows to quote prices in terms of currency only. Money allows to quote prices in terms of currency only. 7 7 Store of Value All assets are stored value. 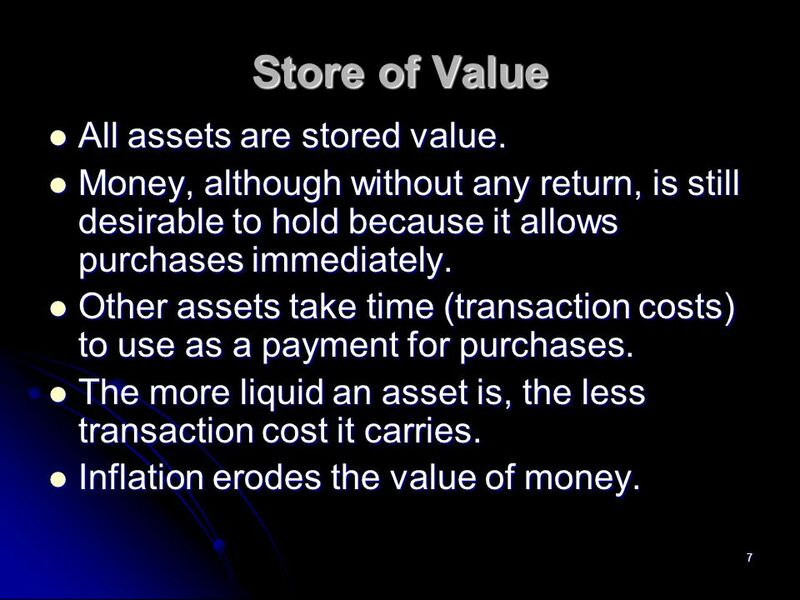 All assets are stored value. Money, although without any return, is still desirable to hold because it allows purchases immediately. Money, although without any return, is still desirable to hold because it allows purchases immediately. Other assets take time (transaction costs) to use as a payment for purchases. Other assets take time (transaction costs) to use as a payment for purchases. The more liquid an asset is, the less transaction cost it carries. The more liquid an asset is, the less transaction cost it carries. Inflation erodes the value of money. Inflation erodes the value of money. 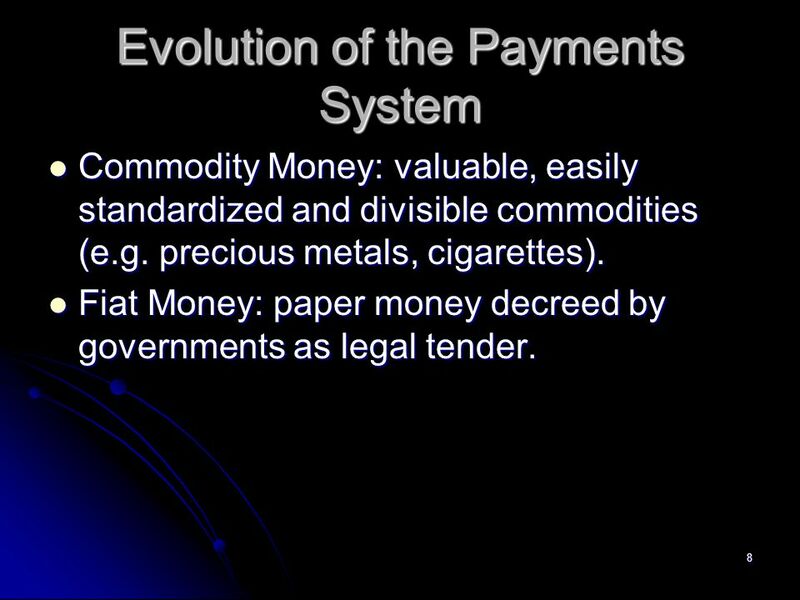 8 8 Evolution of the Payments System Commodity Money: valuable, easily standardized and divisible commodities (e.g. precious metals, cigarettes). Commodity Money: valuable, easily standardized and divisible commodities (e.g. precious metals, cigarettes). Fiat Money: paper money decreed by governments as legal tender. Fiat Money: paper money decreed by governments as legal tender. 9 9 Electronic Money Debit Cards Debit Cards Instant transfer from your checking account to merchant’s checking account. Instant transfer from your checking account to merchant’s checking account. Stored Value Card Stored Value Card Gift cards. Gift cards. 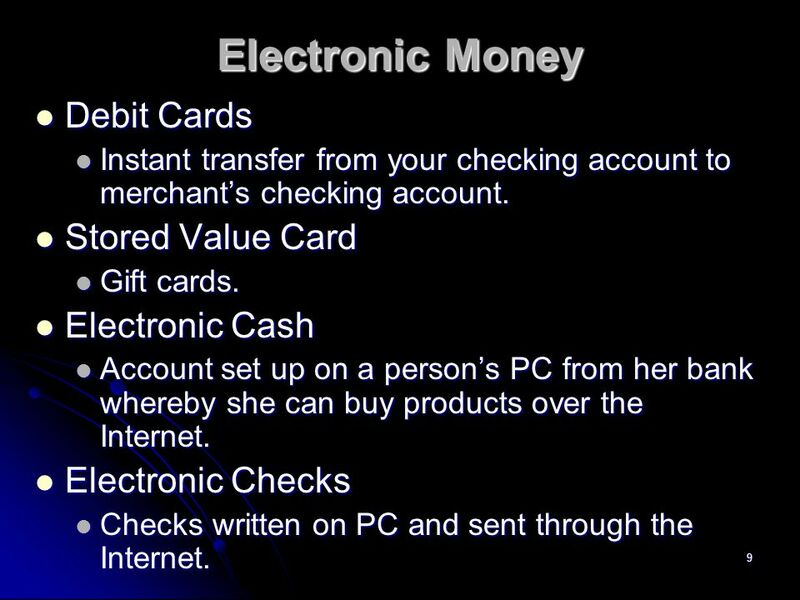 Electronic Cash Electronic Cash Account set up on a person’s PC from her bank whereby she can buy products over the Internet. Account set up on a person’s PC from her bank whereby she can buy products over the Internet. Electronic Checks Electronic Checks Checks written on PC and sent through the Internet. Checks written on PC and sent through the Internet. 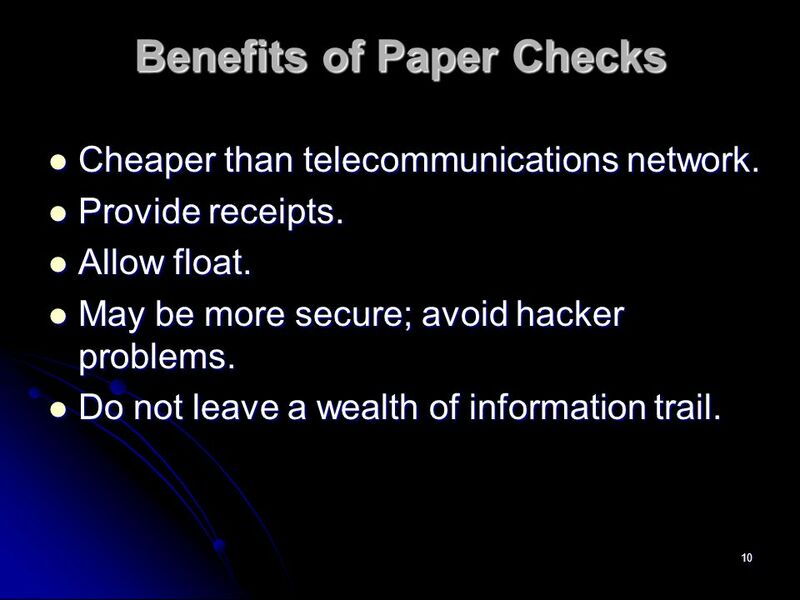 10 10 Benefits of Paper Checks Cheaper than telecommunications network. Cheaper than telecommunications network. Provide receipts. Provide receipts. Allow float. Allow float. May be more secure; avoid hacker problems. May be more secure; avoid hacker problems. Do not leave a wealth of information trail. Do not leave a wealth of information trail. 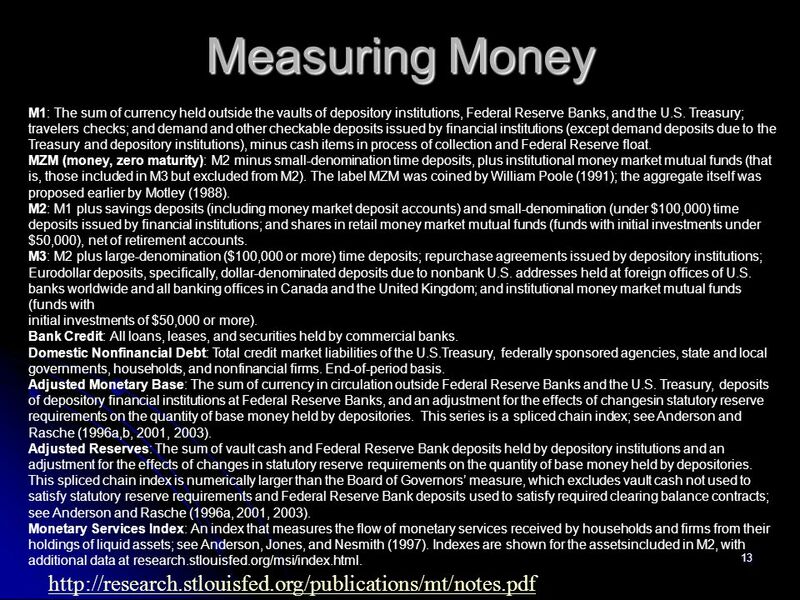 11 11 Measuring Money M1: Currency, demand deposits, travelers checks. M1: Currency, demand deposits, travelers checks. 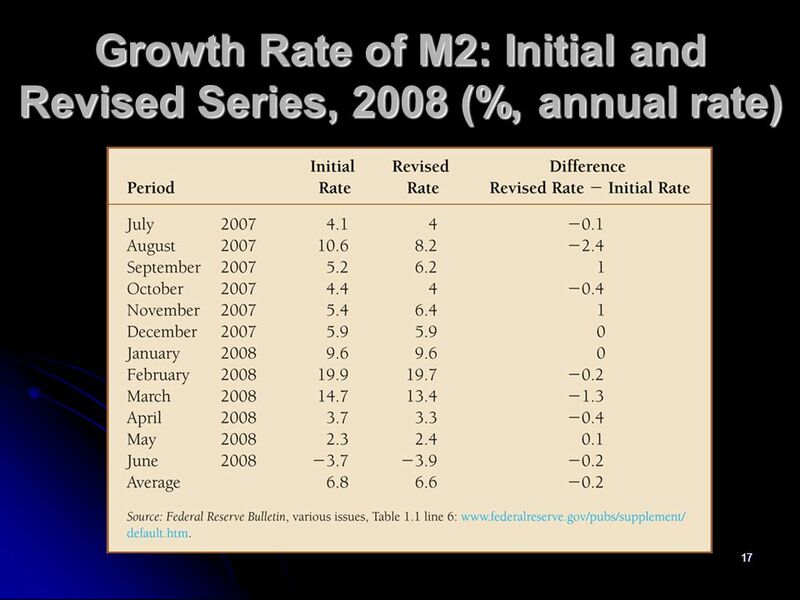 M2: M1, saving deposits, small time deposits, retail MMMF. M2: M1, saving deposits, small time deposits, retail MMMF. 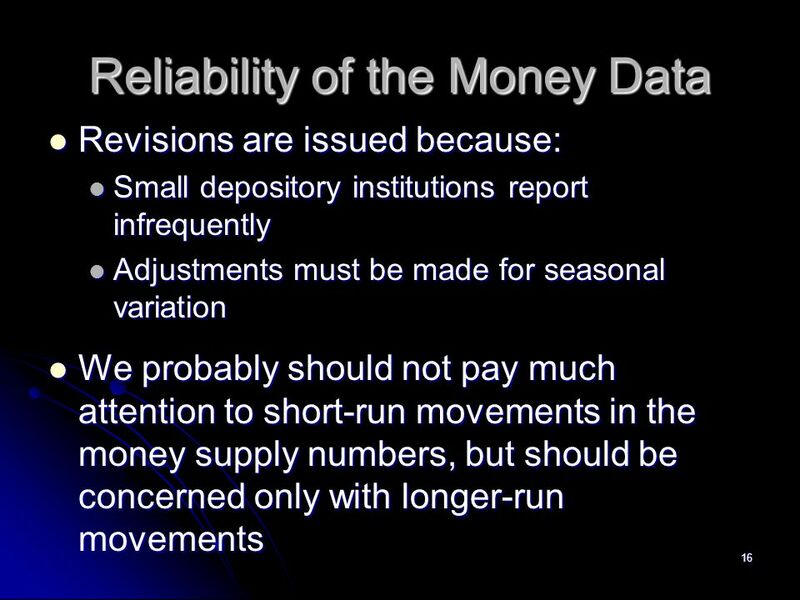 M3: M2, large time deposits, repos, Eurodollar deposits, institutional MMMF. 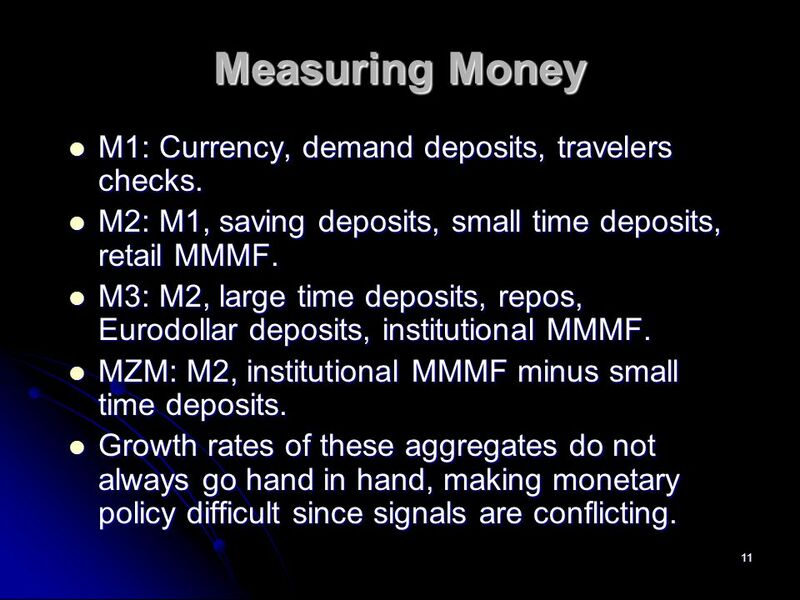 M3: M2, large time deposits, repos, Eurodollar deposits, institutional MMMF. MZM: M2, institutional MMMF minus small time deposits. MZM: M2, institutional MMMF minus small time deposits. Growth rates of these aggregates do not always go hand in hand, making monetary policy difficult since signals are conflicting. Growth rates of these aggregates do not always go hand in hand, making monetary policy difficult since signals are conflicting. 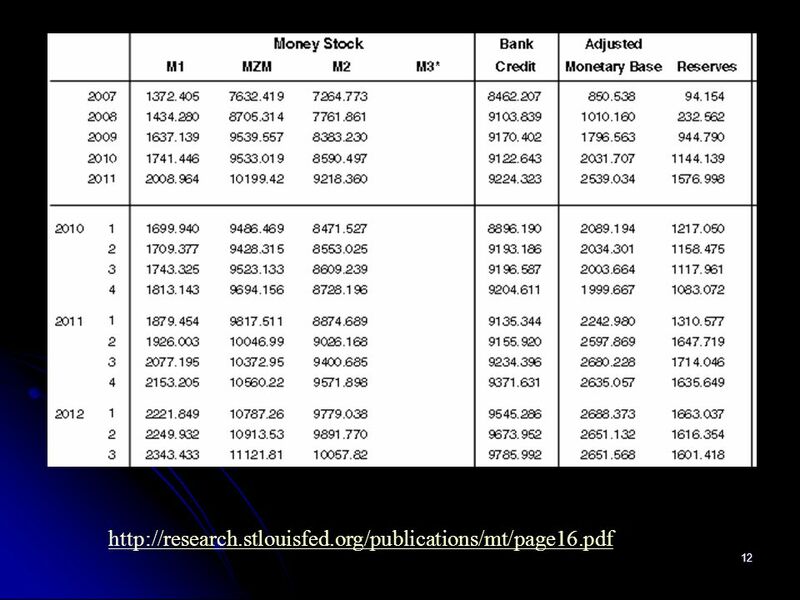 13 13 Measuring Money http://research.stlouisfed.org/publications/mt/notes.pdf M1: The sum of currency held outside the vaults of depository institutions, Federal Reserve Banks, and the U.S. Treasury; travelers checks; and demand and other checkable deposits issued by financial institutions (except demand deposits due to the Treasury and depository institutions), minus cash items in process of collection and Federal Reserve float. MZM (money, zero maturity): M2 minus small-denomination time deposits, plus institutional money market mutual funds (that is, those included in M3 but excluded from M2). The label MZM was coined by William Poole (1991); the aggregate itself was proposed earlier by Motley (1988). M2: M1 plus savings deposits (including money market deposit accounts) and small-denomination (under $100,000) time deposits issued by financial institutions; and shares in retail money market mutual funds (funds with initial investments under $50,000), net of retirement accounts. M3: M2 plus large-denomination ($100,000 or more) time deposits; repurchase agreements issued by depository institutions; Eurodollar deposits, specifically, dollar-denominated deposits due to nonbank U.S. addresses held at foreign offices of U.S. banks worldwide and all banking offices in Canada and the United Kingdom; and institutional money market mutual funds (funds with initial investments of $50,000 or more). Bank Credit: All loans, leases, and securities held by commercial banks. Domestic Nonfinancial Debt: Total credit market liabilities of the U.S.Treasury, federally sponsored agencies, state and local governments, households, and nonfinancial firms. End-of-period basis. 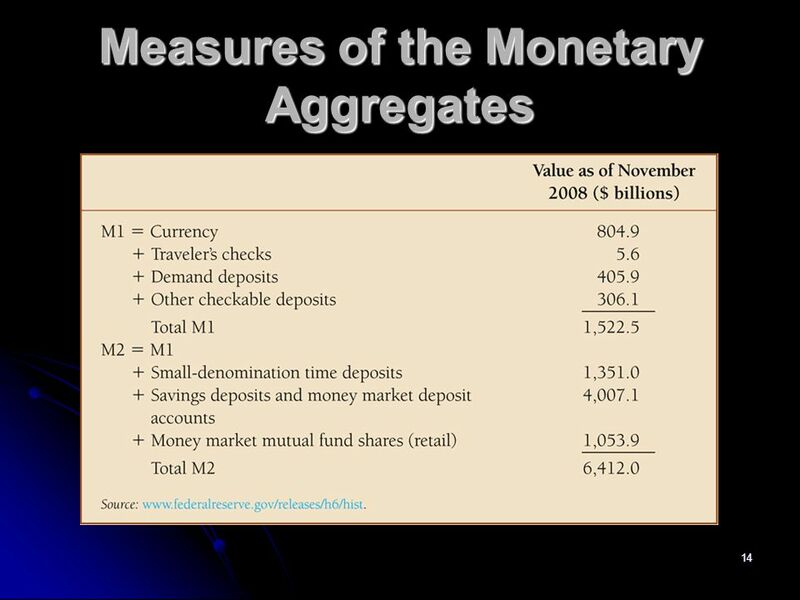 Adjusted Monetary Base: The sum of currency in circulation outside Federal Reserve Banks and the U.S. Treasury, deposits of depository financial institutions at Federal Reserve Banks, and an adjustment for the effects of changesin statutory reserve requirements on the quantity of base money held by depositories. This series is a spliced chain index; see Anderson and Rasche (1996a,b, 2001, 2003). Adjusted Reserves: The sum of vault cash and Federal Reserve Bank deposits held by depository institutions and an adjustment for the effects of changes in statutory reserve requirements on the quantity of base money held by depositories. This spliced chain index is numerically larger than the Board of Governors’ measure, which excludes vault cash not used to satisfy statutory reserve requirements and Federal Reserve Bank deposits used to satisfy required clearing balance contracts; see Anderson and Rasche (1996a, 2001, 2003). Monetary Services Index: An index that measures the flow of monetary services received by households and firms from their holdings of liquid assets; see Anderson, Jones, and Nesmith (1997). 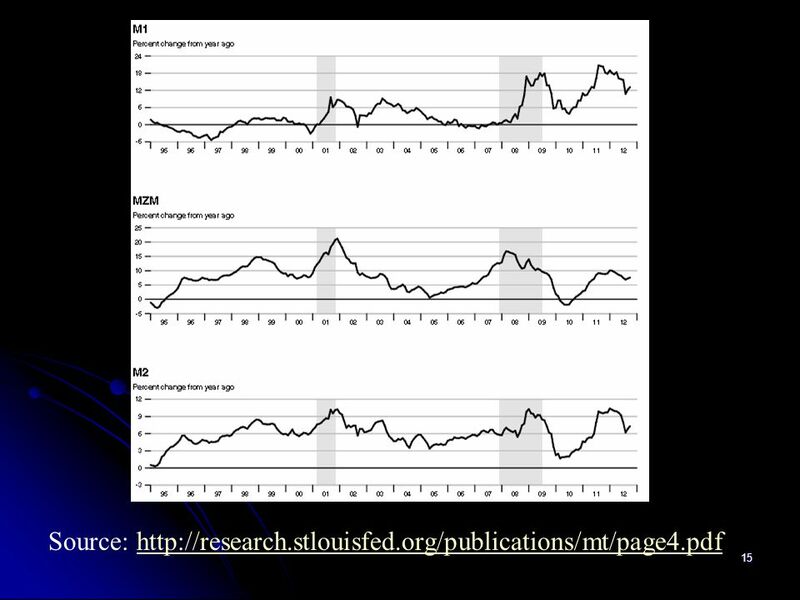 Indexes are shown for the assetsincluded in M2, with additional data at research.stlouisfed.org/msi/index.html. Download ppt "What Is Money? Chapter 3. 2 Meaning of Money Money (=money supply) any vehicle used as a means of exchange to pay for goods, services or debts. Money." 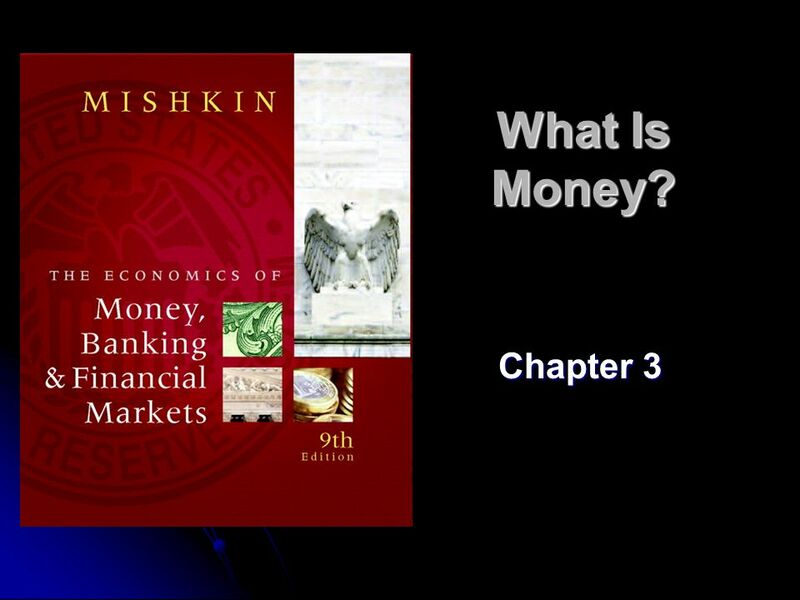 Chapter 1 The Financial System – Money and Prices What is Money? –The Origins of Money Shells, stones, whiskey, tobacco, livestock Precious metals – Gold. Unit 2 What Is Money?. 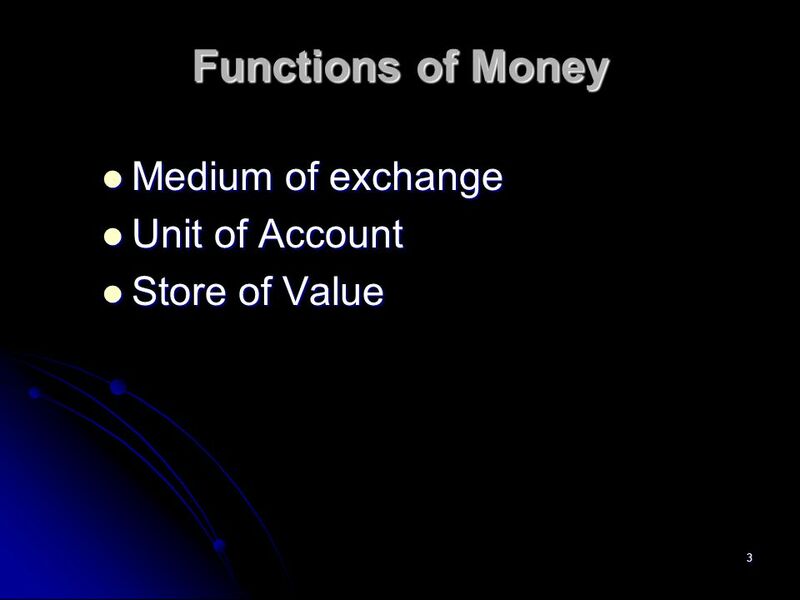 LandskronerMoney slide 1 Prof. Yoram Landskroner Functions and Definitions of Money. Chapter 3 What Is Money?. © 2004 Pearson Addison-Wesley. All rights reserved 3-2 Meaning and Function of Money Economist ’ s Meaning of Money 1.Anything.